"Has destiny been decided already? If so, what is the function of destiny? To bring people together, and separate them without explanation." Usually if you see the words "based on a video game" associated with any sort of filmed entertainment, it's best if you simply run in the other direction, even screaming if you choose. Need I remind you of Mortal Kombat? No, of course I don't. We're all still in therapy over that one.... In all seriousness, most Japanese anime series based on video games are fairly dim or, at the very least, one-dimensional. Thankfully, Arc The Lad is one of the exceptions to that rule. It won't really blow anyone way, but it certainly has a unique way of telling an interesting story. 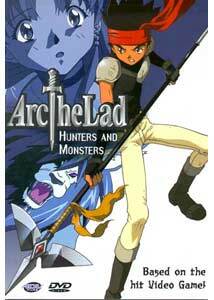 Arc The Lad essentially tells the story of Elk, a bounty hunter who also possesss a mystical ability to summon flame. In the world of Arc, the need for bounty hunters is quite great, with so many terrorists and monsters lurking about. The story begins with Elk and his partner, Cougar, rescuing a hijacked airship. While saving the passengers, Elk and Cougar encounter a Chimera—a mutated, half human/half monster. Since Chimeras are solely the product of the mysterious organization, White House, Elk is suspicious with what they could possibly want with this innocent airship. One of the rescued people is a young girl, Leiza, and her pet monster, Pandit. Leiza has the ability to communicate with monsters, which leads Elk to believe she is also endowed with spirit ability, just like he is. Together with another hunter, Shu, they must hide from authorities in order to get closer to White House, the organization that may have also, possibly, made them who they are. At the same time, Elk seeks the mysterious assassin, Arc, who may even be leader of White House. The paths of many characters will eventually cross as their separate goals bring them to each other. Arc isn't so much your typical action-laced anime series, but a slower, more dramatic program. There's a lot of flashbacks and storytelling to explain much of the past behind the characters. Unlike some anime, though, the process is well done and entertaining. From the minute it starts, Arc carries itself in a way that sort of tells you how it's going to proceed, so you expect the long moments of dialogue and drama. This is not to say that Arc is unexciting—there's some good moments of action— but it just seems, at least in this first volume, to focus more on the setting. Animation-wise, Arc looks very nice, with the clean, sharp cel artwork that seems very similar to other entries in the Sony animation line-up (including a certain similarity to the Wild ARMS anime segments produced for the video games of the same name). It's obvious that Arc is not computer-enhanced in any significant way, giving a sort of raw quality that some modern anime lacks. Another aspect that helps the story along is the wonderful setting; a world in which high-tech merges with a sort of medieval/Jules Verne-esque style, where people drive 1920s-era cars, but fly in balloon-and-propeller airships and combat with swords. In addition to this, there is a rather lush, emotional, orchestral score that really completes the whole package. On the negative side, Arc The Lad develops so slowly and methodically that having only 3 episodes on each disc is a bit of a downer. It's obvious that this show takes its time with the material, and I really think more episodes should have been put together in order to make the story a bit less disjointed. Other than that complaint, Arc is an atmospheric and stylish anime that promises an incredible adventure. Once again, ADV has us hooked into yet another cool series. Image Transfer Review: The fullscreen transfer here is basically perfect, with no signs of compression. The source is also amazingly clean, leading to a disc that basically has no flaws. It's as if the cels themselves were stenciled onto the screen in brilliant, colorful glory. At times it appears as if there's movement and pixelization in the background but, upon closer inspection, it's just the artwork style used, with broad, watercolor-style paint strokes (usually the skies). There is some slight movement in the backgrounds of some scenes, but you really have to look for it. Audio Transfer Review: Aurally, Arc The Lad isn't terribly exciting, but it sounds good. The audio is stereo, and uses a lot of effects and directionality, but never goes into the surrounds. Dialogue is perfectly crisp, and just about everything else is nicely rendered. The musical score really sounds great and carries a lot of ambience in the soundfield. I did notice a distinct drop in quality in the English dub, though; the English soundtrack seems to be about 4-5 decibels quieter (with the dialogue still at normal volume), and slightly muted in terms of the clarity of sound effects. Extras Review: Other than trailers, there are no real extra features. In a nice, convenient move, English subtitles automatically switch on when the Japanese audio is selected. The subtitles themselves are very nicely done, including different coloring (for offscreen dialogue), and even different placement when more than one character is talking at the same time. The presentation is nice, but overall, this is a pretty unremarkable disc. ADV can add another feather to their cap of great anime presentations with Arc The Lad, a wonderful fantasy that's not too 'old-school', and not too 'new-school.' It's worth noting that, although there is a lot of reference to the Arc The Lad video games on this disc, none of the games have ever been released in North America. That's something that gaming company Working Designs hopes to change with their ambitious, upcoming port of the Arc The Lad Collection for the Sony PlayStation, which will feature all 3 official games (translated into English) and some significant extra features. Check out their website at Working Designs.com, and look directly at info on the collection here.